The National Taxidermists Association met at Seven Springs in early June and Carnegie Museum of Natural History Collection Manager Stephen Rogers was invited to give a seminar on the early history of taxidermy in the United States. collects old publications, tools, as well as antique furniture, he created a taxidermists’ work table as it may have been circa 1898.
hand-wrapped artificial body which would have been put inside the skin, a book on the Birds of Pennsylvania opened to a hand-colored plate on flickers, and then eyes and tools that might be used in the process. 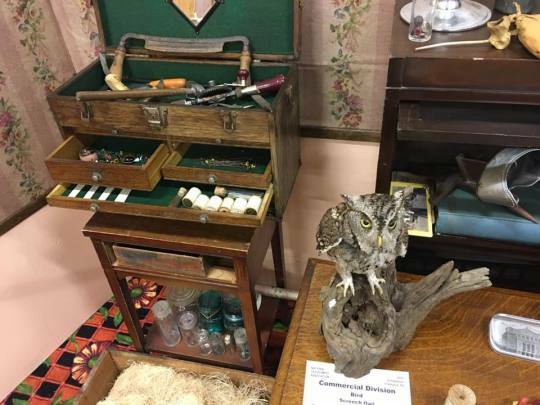 Behind the table was a re-created room with antique looking wallpaper with various decorations on the wall, deer antlers, an 1898 poster of a Winchester calendar, and a framed 1873 newspaper with a woodcut depicting a taxidermist and an ornithologist. Assorted other birds, a tool chest with period tools, and supplies to mount birds (excelsior, tow, cotton, glass eyes of different sorts, etc.) were also present. A library of 15 taxidermist and naturalist books published between 1874 and 1898 were in a lawyer’s glass-front bookshelf alongside a Stereoviewer with a handful of stereophotographs depicting taxidermy. Glass jars containing what appeared to various noxious chemicals were set on top of the bookshelf. A number of people asked about the green chemical in one jar. Was it arsenic? – No, just some powdered lime Jell-O. The public as well as the taxidermists who attended the convention were able to vote for pieces in the competition. The exhibit won ‘People Choice – Original Art’. But more importantly, it gave people and appreciation for history and reference for those that came before. Steve Rogers is a collections manager at Carnegie Museum of Natural History. Museum employees are encouraged to blog about their unique experiences and knowledge gained from working at the museum.